The Bayeux Tapestry is an historical artifact that has fascinated me for many years now. I have visited it at least half a dozen times over the years and it never fails to impress me. It depicts such a pivotal moment in British and Channel Island history, that of the invasion & conquest of England by William the Conqueror in 1066. This combined with the fact that you can be literally centimeters away from a beautiful artifact that’s nearly a thousand years old! So here’s a few salient details about it to whet your appetite to go and see it. The tapestry is not a tapestry in the normal sense. It is actually an embroidery of at least eight coloured wools, worked into pieces of linen. It is divided into a series of connected panels, approximately half a meter wide and 70 meters long. It depicts important scenes which led up to the Norman invasion of England and the Battle at Hastings in 1066. They say that history is always written by the victors and the Bayeux Tapestry depicts events from a totally Norman perspective. The tapestry is probably the most important pictorial image of the 11th century. It is is one of the most important pieces of medieval art from any century. A work of enormous skill, it has priceless value as a piece of art in itself, and it is also an important source – a vital piece of historical evidence – for a key moment in Britain’s national past. The Bayeux Tapestry is preserved and displayed in Bayeux, in Normandy, France. Nothing is known for certain about the tapestry’s origins. In March 1067 William the Conqueror returned to Normandy until December 1067. His half-brother,Bishop Odo of Bayeux, was made Earl of Kent and became William’s Deputy in England in the autumn of 1067. It is probably about this time that Bishop Odo ordered the creation of the Bayeux tapestry. The Bayeux Tapestry was first shown at the dedication of Odo’s cathedral on 14th July 1077. This gives a period of ten years during which time the Bayeux tapestry was probably made. Some historians argue that it was embroidered in Kent, probably in Winchester where there was an established embroidery works. This fits in nicely with Bishop Odo being made Earl of Kent. As a piece of Norman propaganda it must’ve been galling for the English to have to produce it for their Norman Overlords. What does it depict ? 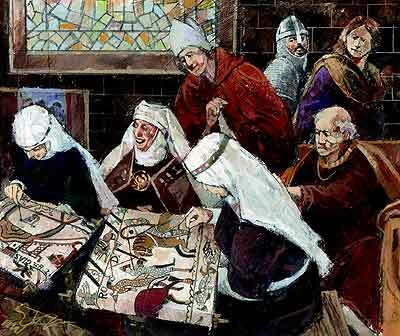 The pictures of the tapestry tell the story of the adventures of Duke Harold Godwinson, brother-in-law of King Edward the Confessor, who was shipwrecked in Ponthieu in 1064. Following his rescue by William, Duke of Normandy, Harold is shown swearing to support William in his quest to succeed Edward the Confessor as King of England – a promise which he was later to break. We then see Harold returning to England and being acclaimed as king after Edward’s death. But the oath sworn by Harold to William is reported in only one other source – William of Poitiers’ ‘Deeds of Duke William’, another Norman account, written some ten years after the conquest. The Norman version clearly needed this event to have happened – but we cannot be sure whether it did, or did not, take place. Either way William felt he had a justification for invasion. Next we see William’s preparations for the invasion of England and the decisive Battle of Hastings. One of the most striking images is the one that depicts the slaying of Harold with an arrow through his eye. That Harold died in this way is a fact ‘known’ to almost every English schoolchild. But is it true? 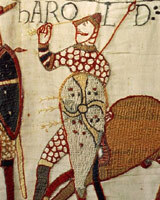 The inscription in the tapestry reads ‘hic harold rex interfectus est’, with the name ‘harold’ written above a warrior with an arrow in his eye. But the words ‘interfectus est’ (has been killed) appear to refer to a second warrior being hacked down by a mounted Norman swordsman. The tapestry is our only source on this point, so we cannot know which of the two figures was meant to be King Harold. The tapestry approaches this piece of history from the Norman perspective, attempting to justify the invasion launched by William to claim what he believed was rightfully his. The image of Harold that the tapestry projects is one of a double-dealer who broke a sacred promise to William. One interesting and intriguing thing of note is the tapestry borders. There are two of them, upper and lower. Both are filled with mythological figures, lions, dragons, farming and hunting and scenes from Aesops fables. The significance of the scenes has been debated and there are views that believe the themes of deceit, and unlawful possession in the fables have been used as a vehicle by the English embroiders to express their dissent and horror of the Norman invasion of Britain. But we’ll never know for sure. Guernsey’s Link to the Tapestry …..